Born in a garage in New Jersey, Skid Row was founded in 1986 by Rachel Bolan & Snake Sabo. They soon pounded the New Jersey club circuit, always with packed houses wherever they performed. 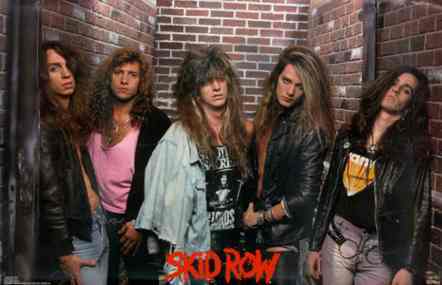 In 1989 Skid Row's debut album sold over 5 million copies in the U.S. alone. The bands debut album contained hits like, "18 and Life", "Youth Gone Wild" and the power ballad, "I Remember You". Skid Row's rocking sound coupled with Sebastian Bach's uncomparable pipes made them a hot hair band staple in the late 80's. In 1992 "Slave To The Grind" was released which debuted at No. 1 on the Billboard charts making them the first Heavy metal/Hard rock band to do so. The album eventually made multi-platinum status with hits like the title track, Slave To The Grind. With two hit albums under their belt, Skid Row went out to do a massive world tour. In 1995 the band released their final album, Subhuman and soon after parted ways due to straining relationships.